REMEMBER when the ‘‘c-word’’ was considered the absolute worst, most shocking, most pantsdroppingly offensive word in the English language? If you’re scratching your head thinking, ‘‘But isn’t it still?’’, then it’s quite likely you’re over the age of 35, don’t really use social media – and haven’t watched TV in a while. I’M going to start this week’s column with a veiled reference to a swear word, so I do hope you’re sitting down and have a brown paper bag handy to breathe into. Remember when the ‘‘c-word’’ was considered the absolute worst, most shocking, most pantsdroppingly offensive word in the English language? If you’re scratching your head thinking, ‘‘But isn’t it still?’’, then it’s quite likely you’re over the age of 35, don’t really use social media – and haven’t watched TV in a while. 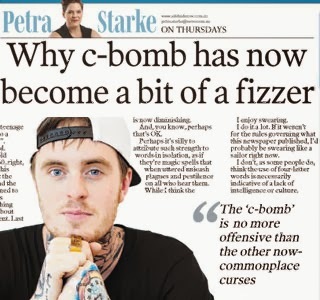 You may very well be one of the few young people who are still shocked by the ‘‘c-bomb’’ and refuse to use it, but from what I’ve seen they’re the minority. Because despite many still considering it to be the final frontier when it comes to curse words, for most under 35s these days ‘‘see you next Tuesday’’ is as shocking as . . . well, ‘‘see you next Tuesday’’. I’m not talking about the rough types who yell it out before either throwing a punch or collapsing in a pool of Bundy and spew on the pub floor. They agree it’s shocking, that’s why they’re yelling it. For these Australians – and I stress I am talking about Australians here, because the word is usually still greeted with slack jaws and wide eyes in most other parts of the English-speaking world – the ‘‘c-bomb’’ is no more offensive than the other now commonplace curses that have paved the way before it into mainstream lingo. In Adelaide earlier this month with his band The Janoskians, Melbourne’s Beau Brooks, 19, tweeted the word to his more than 340,000 mostly teenage followers, referring to a friend as a ‘‘sick c . . . ’’. Nobody was offended. Twenty-six-year-old Melbourne rapper 360 dropped the word in his acceptance speech at the ARIAs last month, and the only people that seemed to care were the journos scratching for something interesting to write about an otherwise dull event. which the ‘‘c-word’’ was just about the only one you could understand. It was voted the song of 2011 by the music website Pitchfork. in the English language with a genuine power to shock’’. It seems even that power is now diminishing. And, you know, perhaps that’s OK. Perhaps it’s silly to attribute such strength to words in isolation, as if they’re magic spells that when uttered unleash plagues and pestilence on all who hear them. doesn’t shock or upset me when others use it casually in conversation. I enjoy swearing. I do it a lot. If it weren’t for the rules governing what this newspaper published, I’d probably be swearing like a sailor right now. I don’t, as some people do, think the use of four-letter words is necessarily indicative of a lack of intelligence or culture. And I admit, I quite like the ‘‘c-word’’. I find it harsh, yes. It’s certainly a stronger curse than the ‘‘f-word’’ or ‘‘bloody’’, which – look – you can even print in the paper. But is it The Most Offensive Word? No. If you’re looking for that, you can probably find it on Twitter. I bet it even has its own hashtag. First published in The Advertiser on December 13, 2012.